This is the final post in my multiband series, and today I’m going to focus on my own personal experiences and specific gear/plugins that I’ve used in my ongoing multiband saga. While I might get specific on gear/plugins, I will still try and keep some broader approaches in all this that you can take and apply to what you have access to now or in the future. For example, I’ve never used the multibands built in to the Digico desks, but the same concepts I’m using should apply there. As I mentioned in the first post, I have had an on-again/off-again relationship with the multiband compressor. 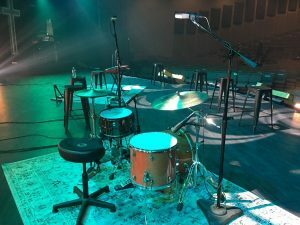 When I came on staff at North Point about five years ago, my good friend Chris Briley was putting them to great use on vocals which really got this whole thing started for me, and over the years the one place where I’ve made the most use of multibands is on vocals. The vocal is a prime candidate for this because it can naturally be tonally dynamic. Vocal microphones and their varied response curves add another twist to the vocal mix puzzle by sometimes accentuating these tonal variances in varying amounts. Ed Cherney made a comment recently on Pensado’s Place about mic selection and how he’s often selecting mics to hide the problems in a voice. 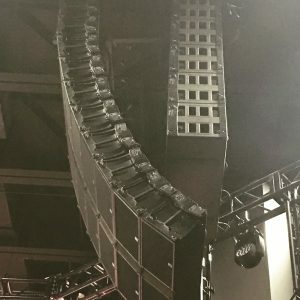 Finding the right mic for a vocalist is important, however, in the world of live sound we are often limited in inventory, variety, and time to really find that perfect mic fit. The reality for us is sometimes you just need to go with it. I like to use the multiband on vocals to provide a little overall tonal smoothing. As I mentioned in the last post of the series, compressing different frequency bands gives me the ability to even out the dynamic tonal changes in a vocal. On the one hand, I don’t want to take the changes all out because these changes can also be natural to our ear. What I’m looking to do is keep the notes that occasionally stick out in check and balanced with the rest of the voice. If there is a particular note or tone in the voice that’s a constant problem, an EQ is much better suited to cleaning that up. If I have something that sticks out only in certain parts of a song, I might try to go after those with the multiband. For me these problem tones tend to be primarily in the upper-midrange of the vocal. A properly used multiband here can be a big help beyond a traditional EQ because over-EQ’ing in this area can reduce vocal clarity. I’ll typically try and center the band on the area where things tend to be most problematic, but in general this band is probably going to run from around 800-1000 Hz to around 5-8k. Additionally, I might try and help tame some of the low-mid junk that might crop up on a vocal, but I find this a bit harder to do with the multiband compared to the dynamic EQ in the Rane Dynamics plugin. Sometimes when a vocalist sings in their lower register, they can get a little muddy and the Rane is great for cleaning that up during those sections. It can be harder to get the multiband to clean this stuff up because when singers go lower and get muddy, they tend to also be singing softer. Consequently, what works when they sing soft might be too much when they dig in. The multiband can still help with this sort of thing, but my own milage has definitely varied here. In addition to vocals, I’ve also been starting to find the multiband useful on some instruments. For example, our keyboard players sometimes jump between multiple patches. In the past, they would use multiple keyboards for this, however, lately some have been migrating to a single laptop which often presents us with a single stereo line for a variety of patches. The multiband has proven helpful in some of these cases to keep any wide tonal variances between patches from jumping out too much. For example, someone might play more of a mellow arpeggiated electronic sound in a verse, but then jump to something sizzly in the chorus. In this case, the multiband keeps the sizzly stuff from getting too loud and going over the top. As far as specific multibands go, the McDSP stuff(MC2000 and ML4000) is the most popular on our consoles. I started into the multiband thing with the MC2000 and added the ML4000 a few years ago. Both plugins are similar, although the ML4000 is a little more powerful adding a limiter along with multiband compression, expansion, and gating. While the McDSP stuff is very robust, in my experience it has also been difficult to master. It seems like most guys I know who use them quite a bit don’t struggle much after they’ve mastered them, but I think the learning curve can be tough. Personally, they’ve helped me about as much as they’ve frustrated me to use, and I’ve often found there can be a fine line between overcooking something and not getting things to work right. Don’t get me wrong, though, because I’ve heard these put to great use and been happy with my own results at times, but just be warned that throwing these on a channel isn’t going to immediately work. Of course, that could be said for just about any of the multibands. Lately, I’ve been relying on the Waves C4, and it has been a lot easier for me to work with than the McDSP stuff. I wouldn’t say one is better than the other, but I think right now I prefer the Waves C4. It simply woks a little better for the way my mind works when mixing. One of the keys for me and the Waves C4 is a very simple thing in the interface. If you look at the graphic above, you can see there are nice little markers in the center of each band. This simple little thing makes setting bands a little more intuitive for me because I can simply drag those markers to the problem frequencies to center the bands on the most troublesome areas. Additionally, the rest of the controls are a little more simplified replacing ratio controls with Range which adjusts both the maximum amount of boost or attenuation along with the ratio (greater ranges lead to greater ratios). This is nice because you can help ensure that you won’t overcook things by keeping your range lower, however, you don’t get the same amount of control you’ll get with the McDSP plugins. I just feel like I can dial something in a lot faster with the C4 than any of the other multibands I’ve worked with. 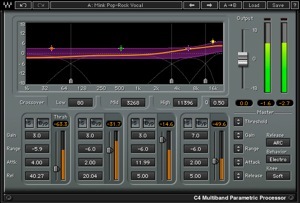 When using the C4 on a vocal, I’ll start by getting the EQ as close as I can along with any deessing first. If there’s still an issue with something, I’ll turn on the C4 and slowly lower the threshold for the bands in any troublesome areas until things clean up. The upper-mid band typically centers around 2.5k-3k and the low-mid band typically centers right around 250 Hz for me. The more I’ve been leaning on the C4, though, the more I’ve been using it in a hybrid sort of way. On the one hand I use it to tame troublesome issues in upper-mids, but I’ve also started using it as my overall vocal compressor often in lieu of a stand alone comp. 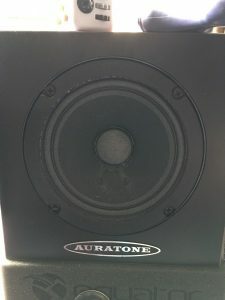 Finally, I sometimes use it for final vocal mastering by boosting or cutting bands a bit. For example, I might turn the low-mid gain down a dB or two while boosting the high band a bit to add some air on the vocal. While a multiband can seemingly do a variety of types of signal processing, when starting out it is best to employ it last. Be careful not to confuse the ability to employ dynamic EQ with a true EQ. If there’s a constant issue with a vocal, first try and fix it traditionally standard with EQ or compression. When attempting to tame problem tonal areas, start small. Necessary attack times will depend largely on the frequency you’re trying to compress or to trigger the compressor. Remember: distance = time when it comes to audio. Higher frequencies will need faster attack times than lower frequencies. Start with a lower ratio between 2:1-4:1, and slowly lower the threshold until you’re getting a couple dB of compression, and you can hear your trouble area being impacted. If it’s still not enough you can try lowering the threshold some more or increasing the ratio. 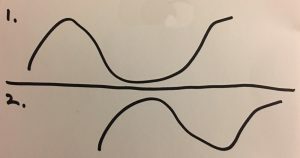 Lowering the threshold too far could cause you to compress more than just your troublesome frequency so sometimes a higher ratio is the answer. As I’ve stated several times over this series, multibands can be dangerous. Don’t be afraid to get a second opinion from someone else to make sure you’re on the right track and not overdoing things. It’s easy to get tunnel-hearing and only focus on the problem area. Another set of ears can help bring you back to the overall vocal or instrument that will be heard. Good luck, be careful, and have fun. I love the Waves C4 too. Even better is their MinMB plugin. I regularly use it on vocals and/or the master fader in Pro Tools. I typically brighten vocals with the LinEQ plugin and then de-ess with the LinMB plugin. If needed, the same plugin can also de-mudify the vocal too. Like you said, the key is not overdoing it. I typically pull the range sliders way down to hear the effect clearly, and then at the end pull them way up (2-3 dB or so, although de-essing often requires a little more).